Since my baby boy was born last March, I have been busier than I ever have been. I did not foresee how much energy it would take to take care of him and a two year old at the same time. My wife is able to stay at home at the moment, so we are blessed. She does most of the heavy lifting when it comes to the children, but when I’m home, there is no time off. For a while, I was trying to maintain all of my disciplines. That wasn’t working. I decided I had to re-examine my daily and weekly routines. I was feeling like I wasn’t accomplishing what I needed to accomplish on a weekly basis. The truth was, I was pouring my energy into my children and I was scrambling to practice, meditate, shoot my bow, etc. in between feedings, diaper changes and story times. I have worked hard in the last five to ten years in becoming a better musician. I have practiced almost every day, both drums and guitar. When Angelo was born I gave myself a few weeks of down time, then I went right back to it. That lasted a few weeks until it started to break down. I just couldn’t keep up. So, I just let my musical practice go all together for a while, but I desperately missed it. It took a month or so for it to sink in, but I was absolutely craving playing again. But, I still didn’t have the time or energy to maintain a full discipline. I’ve worked too hard and covered too much ground to let it slip. I needed to at least maintain my strength and dexterity. So after looking at my life’s territory map, I determined that if I practiced both drums and guitar three times per week for twenty minutes each, I could hold my ground. So, that’s what I’m doing until my life opens up again. Once I looked at my life and I made a different commitment to myself, I felt better. When I was unable to honor the commitments I had made I was constantly feeling guilty. At the end of the week I just felt drained because I was exerting way too much energy into my disciplines and failing. My intention now is to be as present with my children as much as possible while I’m with them. I’m seeing that changing a diaper isn’t a distraction from what I “should” be doing. It’s what I want to do. I signed up for this. Like everything else, it’s about balance. How can I enjoy my children and give them the dad that they deserve and still accomplish my life’s goals? For right now, my life’s goals are are pause. But, like I said before, I just want to hold my ground. If I can stay as good of a guitar player as I am right now, I’m ok. If I can keep rolling my triplets as smooth as they are at the moment, I’m good. I just don’t want to pick up my instruments two years from now and feel like I’m starting from the beginning. 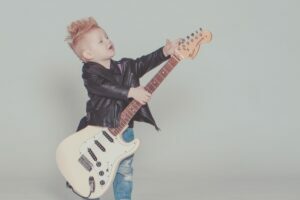 When I took a break after my last baby was born (and I do mean LAST), and when I finally picked up the guitar again, my muscles were stiff and achy after playing for five minutes. I couldn’t do some of the techniques I had been working on for years. That was enlightening. Just by picking up the guitar and playing for twenty minutes, three times per week, I can maintain my muscle tone and muscle memory in my hands and arms. That way, if a nice show opportunity comes along, I can accept and know I’ll be performing at my highest level still. I’ve definitely made a decision to not take any more drumming gigs for a while, unless they are handsomely paid. I’m just going to keep my chops up until I have more time to commit. Life is funny, but music is always there. I’m learning not to be obsessive about my disciplines, but I’m listening to the voice that tells me I need to stay sharp. Giving up is not an option.